The Council hosts its fair share of heads of state and government, all of whom arrive surrounded by bodyguards and aides, but Erdoğan had a far more massive entourage than any I'd ever seen; by my estimate, they numbered 35, nearly all of them young men in dark suits. Odder yet, they took up the first three rows, where they sat spellbound to their leader's every word, as though they had never heard a word of it before. Even before he spoke, then, the profusion of fluttering staffers conveyed an aura of grandiosity – as was no doubt their intended purpose. Also, the Council rarely permits teleprompters but Erdoğan relied on one, although it's unclear why it was necessary, given that he spoke in Turkish and gave his standard attack-dog speech berating many of Turkey's neighbors and going after such current favorite targets as Fethullah Gülen, the Moody's and Fitch credit-rating agencies, and the New York Times. Experiencing Erdoğan in person confirmed my sense of him as an ambitious and aggressive populist whose electoral successes have gone to his head and spell trouble both for his country and the world. A protracted "I'm not an antisemite" defense was the only content specifically designed for a New York audience: "I am very sad to see that my country, myself, and my colleagues, sometimes, are labeled as being antisemitic." As he spoke about being labeled an antisemite, I admit to taking advantage of sitting directly in front of Erdoğan, just behind his three rows of dark-suited young men, vigorously nodding my head in assent, thinking all the while that I was glad to be in New York and not Istanbul. Perhaps most amusing was the argument that all was well when the Ottoman Empire ruled and things fell apart after its demise in 1923. "The Ottoman State had a very successful administration system, and for centuries, these areas of crisis today had maintained their existence without problems. The Palestinian issue, the problems in Iraq and Syria, Crimea, Balkans, are all issues that came about after the dissolution of the Ottoman Empire." The question period, as usual, held special interest because it is the only part of the meeting that is unscripted. The moderator, Fareed Zakaria, pressed Erdoğan on the quid pro quo for the release by ISIS of the 49 Mosul hostages; Erdoğan all but explicitly admitted that his government had exchanged prisoners for the hostages. Peter Galbraith asked about the possibility of Turkish recognition of an independent Iraqi Kurdistan, to which Erdoğan replied no, that he opposes any division of Iraq. On behalf of the International Press Institute and the Committee to Protect Journalists, Harold Evans of Reuters requested a meeting with Erdoğan to discuss the treatment of journalists in Turkey, to which Erdoğan gave his immediate assent. Margaret Warner of PBS asked about Turkish efforts to stop the flow of foreign jihadis going into Syria and Iraq, to which Erdoğan piously replied that the government is doing all it can, even professing to be insulted when Warner pressed him about Turkey's porous border with Syria. I then asked my own question: "Your government as prime minister pursued a policy of 'zero problems with neighbors'. Now that that has failed, do you have a new policy towards the region?" My intent was to provoke the speaker by asserting the failure of this policy. 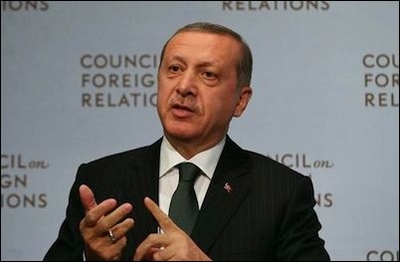 Erdoğan replied that the "zero problems policy is still ongoing" and then insisted that the failures were those of the neighbors, rather than of Turkey, mentioning Iraq, Syria, and Egypt in this context. Especially noteworthy was the withering disdain he expressed for President Sisi of Egypt, to whom he referred as "a soldier in [Morsi's] cabinet [who] organized a coup." Related Topics: Turkey and Turks | Daniel Pipes receive the latest by email: subscribe to the free mef mailing list This text may be reposted or forwarded so long as it is presented as an integral whole with complete and accurate information provided about its author, date, place of publication, and original URL.